Inspired and encouraged by the early spring, we started planting our herb garden last week. We planted som dill, basil, courgette and cucumber seeds. 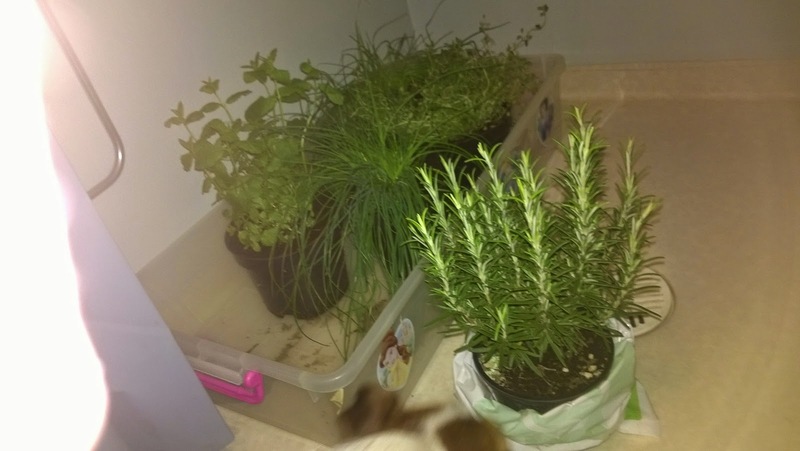 Also, we got some thyme, mint, rosemary and chives in pots and transferred them into bigger pots and placed them all in out mud room, our cold foyer. Then we got hit by winter again. The pots with seeds are still in the mud room, but the potted plants we needed to take inside. So now our shower room is hosting our herbs until spring comes back. I guess this is just how it always goes in Finland. The dance of prince winter and the spring fairies. We've even got songs about it.